My mom has been making this for years, and it has always been one of my favorites. The combination of sweet, salty and crunchy is a true winner! It's easy to put together, although cutting up the broccoli can be time-consuming. To save time, you can buy packages of broccoli that are already cut up in the produce area of the store or even try using a package of broccoli slaw. 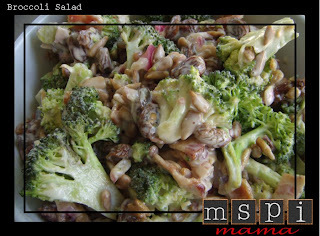 In a large bowl, toss together the broccoli, raisins and onion. In a small bowl, mix together the sugar, vinegar and mayonnaise until smooth. Pour over the broccoli. Chill several hours or overnight. Just before serving, mix in the bacon and sunflower seeds. Tip: The original recipe calls for 1-1/2 cups of raisins and 1 cup of sunflower seeds. I personally find that to be too much, but feel free to adjust the amounts to your preference.